Kieran Suckling’s academic inclinations stem from his experience studying the extinction of species and languages in graduate school. While researching snowy owls in graduate school, Kieran was inspired to start the Center for Biological Diversity based in Tucson, Arizona. The center, which started in 1989, focuses on protecting biodiversity and imperiled species. It employs attorneys to use litigation to effect change and conserve species. Kieran cited pesticide use as an issue that could use more focus and work from students. The topic allows students to get involved with policy at the local level. The topic of pesticides also ties in with food issues, which has caught the interest of students. Klyza echoed this statement saying that food is the only topic that has rivaled climate change in the academic setting at Middlebury. Both issues are tangible and applicable. 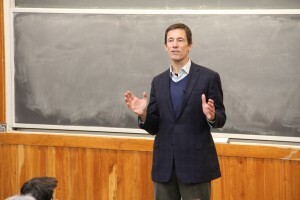 In response to a question surrounding the growth of technology in biological conservation, Kieran stated that the growth has allowed knowledge to be cheaper and more accessible. Using big data sets has had positive impacts on health and enables conservationists to quantify their work in the field. The downside is that there has been a greater interest in synthetic life, which could be catastrophic down the road. In terms of what the program may be overlooking in terms of assigned readings, Kieran said that although he came into environmental work through the humanities, he did not do a lot of reading in traditional environmental literature. He believes that traditional environmental texts describe issues as if they are uniquely environmental issues, but in many ways none of them are. Kieran recommended getting the students to think about big picture issues, not just environmental issues. Such as, how did we get here and how does this impact what we’re doing today? This reading may be more refreshing and provide more connectivity. Kieran spoke to the importance of recognizing the niche that Middlebury has in the liberal arts. He stated that the College has a history and reputation in this field and thus a responsibility to uphold. He asked, “If you don’t get humanities into environmental issues, then who else?” Humanities thinking is what is needed to make sense of issues, see how things fit together, and push the environmental movement in the right direction. Kieran cited the Environmental Humanities Graduate Program at University of Utah, started by Terry Tempest Williams, as a program successfully instilling a deeper way of thinking about the environment. In attendance: Dan Brayton, Jack Byrne, Molly Constanza-Robinson, John Isham, Nan Jenks-Jay, Chris Klyza, Marc Lapin, Avery McNiff, Diane Munroe, Peter Ryan, Steve Trombulak, Janet Wiseman. Gary Nabhan, author, farming and food advocate, and W.K. Kellogg Endowed Chair in Sustainable Food Systems at the University of Arizona Southwest Center, visited Middlebury as the 2014 Environmental Writer-in-Residence. 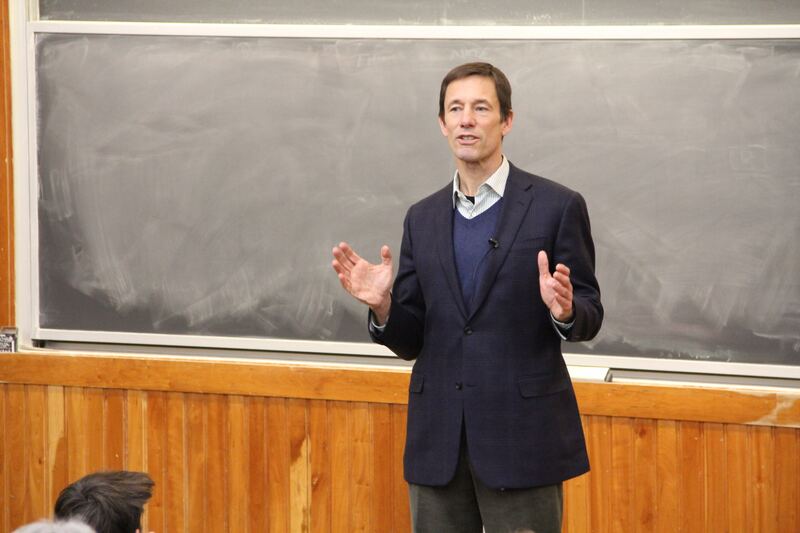 Gary met with Environmental Studies faculty and staff to discuss the future of environmental education. To begin the conversation, Gary asked attendees to direct the conversation by raising a question or idea. Steve Trombulak asked, “What should we be doing that’s different for the next 50 years? What have we been too narrowly focused on?” Peter Ryan brought up the challenge of balancing environmental science core concepts with global concepts in introductory environmental studies classes. Marc Lapin asked how professors could incorporate less traditional ways of knowing into curriculums. Molly Constanza-Robinson shared the need to train the next generation of scientists to think more broadly while being informed citizens. Diane Munroe asked, “What can we do more deeply with communities?” Dan Brayton shared his goal of serving majors with core courses while expanding the scope of what we imagine the’ environment’ to be. Nan Jenks-Jay asked about how the Franklin Environmental Center can develop in the future to better meet the needs of students. There is a potential of eco disruption, resource scarcity, political disruption. Our quality of life and economic wellbeing may dip. The way people absorb information is different. Science is done as a western discipline, but there are more science students and scientists that are not a part of western culture. There are now different cultures and different perspectives in the science field and it is not culturally neutral. Gary proposed the idea that we’re all designers of the future and we can all contribute with our own passion or discipline. The conversation then focused on connecting with the community. Gary stated that social problems in Vermont are not always visible to visitors. He observed that Middlebury students are mature and global thinkers. They have gotten outside their comfort zone are there is a willingness to take on new challenges. Steve raised the issue of prejudging what changes will occur, stating that change is evident, dystopia or utopia. The comment sparked more conversation on this topic. Gary stated that change is already happening. One driver of change (ex. global warming) will not trump everything. Dan then stated that the conversation began with dystopias and Middlebury is considered a utopia space inside a utopia state. Dan recommended that we flip this and asked us to think about problems surrounding Middlebury. He also commented that utopian thinking has a place in critique and action, providing the example of imagining a new college farm that provides an effective local food source. Gary advised the room to be good role models and display a mature sense of activism that is not about instant gratification. Pete Ryan noted that students are more despairing about the present and future and so it is important to share success stories. David Levy is connected to the Curriculum for the Bioregion (CFB), which is an outgrowth of the Washington Center at Evergreen State College. The CFB started with Jean MacGregor, the current director, in 2004. Marc Lapin (ML): Role of contemplative education and using other parts of the brain, using other modes. DL’s “shadow CV” includes teaching meditation at the San Francisco Zen Center. Questions he’s asking and writing about: what does human sustainability look like in an age of info/tech overload? DL believes that misunderstandings that have led to environmental crises are similar to technology-founded crises. One goal of the CFB is the creation of learning communities (see handout). DL’s role is in the “Reflective and Contemplative Practice” sector under “Cultivating Promising Pedagogies for Teaching Sustainability.” Goals of this group are how to bring contemplative practice into teaching and how to experience and practice it themselves; how to bring sustainability and contemplative practice together. DL’s learning community has had several large gatherings of higher-educational professionals. Two other good examples of institutions trying to bring sustainability and contemplative practice together are The Whidbey Institute and The Center for Contemplative Mind in Society at Amherst. Some working ideas of the “Cultivating Promising Pedagogies for Teaching Sustainability” group: How do we hold despair/fear/challenging emotions as we contemplate what is happening to the planet? We do have ways through quieting mind and body to hold more and to develop a larger sense of hope and possibility. How to deal with students – sharing bad news without overwhelming them or pushing them to “quick fix” ideas leads to a greater understanding of life. An example practice of what this would look like in the classroom: In her class, Karen Litfin, a UW political scientist who writes about ecovillages, begins by showing students a photo of the thin strip of atmosphere from space and calls this protective band that is essential to well-being “our skin”. Then she does reflective breathing as a way to demonstrate that the atmosphere is shared – I’m breathing in what others are breathing in and out, and I feel beauty and preciousness of what was once invisible. The overall goal of the exercise is to feel appreciation and connection. Steve Trombulak (ST): How do students respond to this? DL has the sense that student reaction is overwhelmingly positive, but Karen is still an oddball in political science, just as he is in computer science. There is a need for larger departmental support. Nan Jenks-Jay (NJJ): How to integrate across the curriculum & general education so that this kind of practice is not an outlier? Is the activist mindset of students the “quick and easy response” nowadays? Thinking about the momentum of activism versus the practice of stepping back and taking the time to reflect and contemplate for deeper understanding. Rebecca Gould (RG): I think contemplative practice is growing and more people are taking it on in various forms. ML: The common question of newcomers to contemplative practice is “how does it connect to content and disciplines?” Others want to tie it to content that they are teaching. For me, it seems easy and that there are so many easy ways to connect it. For example, the themes of time scales and spatial scales are relevant to any discipline and are good entry frames for contemplative practice exercises. DL explained how he uses contemplative practice in computer science as part of an information and contemplation class that he teaches. He does exercises that ask students to be more mindful of uses of technology and how it affects their physiology. Mindful awareness of their technology use – they chart it over the course of a week and write a reflection paper. Why he does it in order to teach how to find balance amidst technology, fragmentation and isolation. The Center for Contemplative Mind in Society is a newish national organization that held a 5th annual conference in Amherst this year that spanned all disciplines. 400 – 500 faculty attended. Emily Hoyler (EH) & ML: How to carve out time in the classroom for this and reflecting and putting it into personal and community spheres? You need to let go of content to leave time for meaning making. Cat Ashcraft (CA): How to share pedagogies – what is the process? ML: Can’t do solely through workshops, have to sit in on others’ classes. CA: But class visits and co-teaching are almost one-offs, how to really learn and build? DL: It’s great to have conversations with “local colleagues.” His group is distributed across multiple institutions. Their main forums: trying exercises on faculty group, bring additional people in for weekend workshops, and they have a website with database of teaching practices. Various forms of conversation, connection, friendship – out of friendships have come particular bodies of work. ST: Are there assessment/metrics to prove this enhances educational outcomes given our learning outcomes focus? DL said that he’s not active here, not at this point. But he is interested in exploring what are kinds of real learning we care about versus what universities want to measure. RG: There is a ton of literature on the benefits of contemplative practice. DL would love to get a small grant to think about how to go about measuring and assessing. ST: A core challenge is the inability of students to stay engaged for long periods of time. DL: I have a session on cultivating attention on e-mail – how long can you stay on it before starting to web surf, and another one on multi-tasking – reconstruct your own personal multi-tasking strategy, then we talk about – what does mindful multi-tasking look like? Learning from other students and learning they are different from each other. Keep level of sustained curiosity together. Helen Young (HY): Does DL start with technology and then go to more focus on breathing or surroundings? DL: My courses are electives, so I’m not imposing contemplative practice on all students in a 101-level class, but I am thinking about starting to introduce it when relevant in lower level classes. For elective class, I pre-interviews students to let them know what they are getting into and turn away students who have high workloads. You can’t cram for this kind of class. ML: I see potentially much greater impact of DL’s work because it’s coming from a non-ES discipline. DL: The time scale of dispersion of this type of learning is too long. ML: One of the best outcomes is students learning they have conscious choice about everything/all sorts of things. NJJ: Jackson property as a place for mindfulness. Can something like this be embedded early in development of property rather than injecting it into existing structures? SCT: Administrative process weeds out those who might favor contemplative practice. Let’s not be naive that students would use such a space – it can’t be done passively. RKG: All the more reason we should do it. Can’t push it, but student-to-student sharing is a great way and she hears a strong thirst for this type of learning from some of her students. CA: Environmental humanities a likely magnet for these types of students and conversations, but we don’t want to pigeonhole it here. ML: One common ground is that we all have passionate students. They are receptive to contemplative practice because they feel it in themselves that solutions will take much more. CA: It’s still just those students who get it. ST & CA started to discuss the idea of experimenting with contemplative practice at School of the Environment and then bringing it back to the ES program. Need for talent. The environmental world is far more complex than environmentalists would like to believe. Students need to understand that the world is more grey than black and white. Students must learn how to communicate. Writing is important, but listening and articulating a complicated idea are key. Add value to science from outside. General students must understand core science and science students must not get lost in the weeds. Collaboration. Rather than debating, put oneself in someone else’s shoes. Partner with others to better understand complex situations. Learn foreign languages. Environmentalists are not always foreign thinkers. Use social media. Social media is a powerful tool for spreading and sharing ideas. Public policy. Democrats and Republicans have to figure out how to work together. Humility. We should never be so confident in one strategy but rather a mix of different strategies. Lastly, we need to welcome criticisms and work with them.